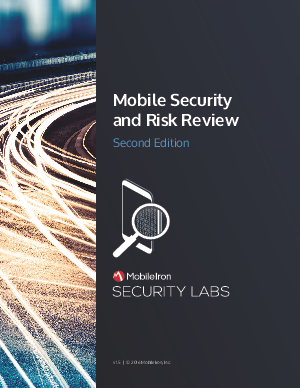 This report from MobileIron Security Labs discusses emerging security risks, reports on OS enterprise share, and lists the top blacklisted consumer apps. We conclude with our recommendations for enterprises to protect their assets against mobile risks and threats. Several new mobile attacks have emerged that threaten enterprises. Most are re-using old tactics against mobilespecific services, such as SideStepper’s use of Man-In-The-Middle (MITM) against MDM, rather than employing new techniques or exploiting new vulnerabilities. When attacks against users are successful, they can result in the loss of both personal and business data.